Think has been created to forge a direct link between contemporary philosophy and the widest possible readership. The central aim of the journal is to provide to a very wide audience - encompassing undergraduates, 'A' level students, students in further education and the general public - highly accessible and engaging writing by philosophers pre-eminent in their fields. 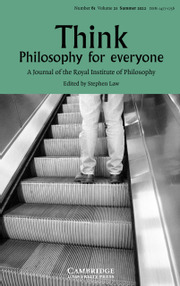 Think also aims to counter the popular impression that philosophy is pointless and wholly detached from everyday life. Its contributors sometimes expose some of the bad philosophy which currently passes as accepted wisdom in certain circles (e.g. religious, scientific, anthropological, etc.). Perhaps most importantly, Think gives contemporary philosophers the chance to help nurture and encourage philosophers of the next generation. Why Revisit the Early Modern Canon?